Got questions about writing? Wednesday is Q and A Day at Teachers Write Virtual Summer Writing Camp, and we’ll have some great guest authors answering. Today’s author guests are Mike Jung and Jess Keating. Mike Jung lives in Northern California with his wife and kids. He writes middle grade fiction, and his, novels GEEKS, GIRLS & SECRET IDENTITIES and UNIDENTIFIED SUBURBAN OBJECTS were published by Arthur A. Levine Books, an imprint of Scholastic. He’s also contributed essays to numerous anthologies and is a founding member of the We Need Diverse Books team. SHARK LADY, and the hilariously informative World of Weird Animals nonfiction series. You can learn more about her upcoming books at www.jesskeating.com, or find her on Twitter @Jess_Keating. Teachers & librarians – Feel free to ask your questions in the comments. It’s fine to ask a general question or to direct one directly to a specific guest author. Our author guests have volunteered to drop in and respond when they can. Note from Kate: I’ll try to be here for Q and A most Wednesdays, too. Please be patient with me if you’re a first-time commenter – it may take a little while for me to approve your comment so it appears. Thank you for sharing today. Mike, I was wondering what your writing process is, are you a pantser or an outline type of writer? Jess, my second grade library students loved your books, how would you describe your research process? I think it’s also important to give yourself time to let the research settle in your own head, creating some space between what you’re learning and how exactly you’d like to convey it. As a writer, I need time to learn, but also time to synthesize it all and sort out how I’d like to express it myself, in my own voice. Because of this, I tend to build that “space” into my process—you’ll see what I mean below! At the end of a day of research, I may have 20 things I’m thinking of including in a book, but maybe 15 of those are flagged as “not so sure about this fact”, while 5 of them are rock solid. A lot of my time is spent tracking down where certain claims came from, and figuring out if they are reputable. I hear a lot of nonfiction authors say to avoid the internet, but I think it can be a fantastic source of information–you just need to know where to look! In my fields of science and zoology, many scientists are active online, and eager to share their latest research! Once I have time to synthesize everything in my head and figure out how I want to express it, the research is what ends up in the book. The argument for having it in the book is for YOU, as you know that you’ve done your due diligence on checking all the facts. Wow, Jess. What an eye-opening answer. I so like your process. I am a bit messy w/my research, but you have given me an easy way to streamline what is verifiable and what needs more sleuthing. Like the idea of a “happy checkmark.” In assimilating my current research right now for a PB bio, I am finding the gaps and it’s in areas I hadn’t even thought about. TY. Wonderful, Kathy!! So glad it’s helpful! Good luck! Hi Martha! I’m both! Or neither! MWAHAHAHAHA…*sigh* Seriously, my process is a continuously evolving hybrid of both – I’ve sold my last two books on proposal, meaning I started out with four or five complete chapters and a broad-strokes outline of the rest of the book, but I do a lot of “oh hey, what if I try THIS completely spur-of-the-moment thing” within that framework. I also still feel very new at this! I feel very good about the fact that I’ve finished writing three complete novels – that’s not an achievement to underplay – but none of my writing processes feel like they’ve reached any kind of mature state. They might not ever feel that way, and that’s actually a good thing IMHO, because nurturing that beginner’s mindset is a valuable thing for me. Mike is a very disciplined writer. That’s important, too!! Hi, Mike and Jess! My question is similar to Martha’s in regard to your writing process. Do you necessarily sit down and say ‘I’m going to write a book, or do you collect ideas and slowly build them over time, or maybe your process is something entirely different. How do you start and work through your writing? Great question. Usually, my creative and writing process is quite intuitive and cyclical. I don’t really “sit down to come up with an idea for a book”, rather I’ve sort of trained myself to notice all the things that pique my interest and curiosity that come at me throughout my day, and *then* have to devote time to actively working on them. This isn’t the case with all authors, but I tend to have at least 7 or 8 projects on the go at a given time, at various stages. This means that I must try to be in tune with where I want to spend my energy at a given time. So, I would say that I definitely collect ideas and slowly build them over time, for the most part. But, I have also experienced moments where I will be struck with an idea that really grabs me (typically, a character or a concept will hook me, in this case), and then the process is more like you describe, where I sit down with the intention of developing a book on that subject. I’d guess that about 95% of my ideas come from noticing the quiet, non-flashy curiosities, rather than those “lightning-strike” moments. PS If you’re interested in growing that creative muscle to notice things, you might like this post, where I lay out some concrete tips I use every day! You both speak to the direction I’ve been leaning toward lately. David Sedaris’ discussion of his process recently inspired me to begin making those notes when I notice something, but I have not been terribly consistent with it. Jess, I began the “one amazing thing” in my notebook today. I’m looking forward to making short notes (as Mike mentioned – though they too may end up in my glove box) and expanding on at least one in my notebook later. I believe this is also something I will use with my students in the fall. I believe my process may be much like yours, Jess. I can see dabbling in multiple projects until one really grabs me. Thank you, again, so much! Hi Tracy, I do collect ideas, observations, notes, photos, etc., and I archive them, but I don’t necessarily go back and comb through them – the value for me seems to lie in documenting the thoughts in the moment. even if it’s no more than a scrawl on a random scrap of paper that ends up sitting in my glove compartment for months, not referencing them at a later time. I do consciously decide to start writing a manuscript, at which point I have to examine the ideas that most persistently stick in my mind, pick one, and then start writing. The “just keep writing” part is, of course, a metaphorical bear, and I employ all kinds of tactics to do it. I constantly remind myself that a book which exists only in my mind is actually a book that doesn’t exist at all, that a crappy, structurally unsound, falling-apart-at-the-seams manuscript that I’ve actually written down is the foundation for a final, complete novel on the shelf, and that the “help, I have no idea what I’m doing” feeling I sometimes have when I’m writing is a positive feeling, because it means I’m doing the work. I don’t feel that way when I’m not doing the work. Jess and Mike, you each in your own unique way have expanded offeriings on the shelves for young readers. I’m curious about your revision process. My guess is that you’ve each had to cut out something that was dearer to you than your editor might agree. How do you relinquish a piece of a larger work that you may have spent a fair amount of time on or you really like, bot others indicate it doesn’t move the narrative along? Hi Barb! I honestly don’t have much of a problem with slashing-and-burning my way through a manuscript. I think that’s partly because my undergraduate degree is in art (I got used to having my creative work very directly critiqued), partly because I spent a few years playing live music as a hobby (there’s nothing quite as dispiriting as playing a song in a crowded coffeehouse while everyone there completely ignores you), and partly because my attitude about working with my editor is basically GAH, YES, HELP, HELP ME, I NEED HELP. It matters that I really, really trust my editor, of course – we talk about each book in depth, and when I tell him the things that are truly important about my work, he responds in kind – but it also matters that I don’t feel like any one book is the end-all be-all of my creative efforts. I like collaborating with my editor, and my work is much, much better because of that collaboration. So, any time I receive some guidance to cut a part of a book that I truly love, my first step is to take a step back. A good editor will never just say “cut this”—rather they will usually articulate their thoughts and give a clear example of why they think this particular spot is bogging down the story (or whatever.) They’ll say what the cutting would accomplish, and be very clear about how they’re reading it, as is. From there, it’s a matter of asking yourself, a) do you agree with their analysis of what is happening in the story there? Can you see their point? and b) do you agree that you need to remove this bit to tighten it up? This is where the trust comes in. I trust myself as a writer, but I also know that as the closest person to the story (and that’s the case with *everything* I write! ), I will miss things that others don’t. It’s kind of like not seeing the flaws in one of your beloved, but dated movies! So, I also trust those I work with. If my agent or editor is suggesting a cut, I just know from experience that *they* know what they’re talking about, and that trust comes from growing with them over time. I can’t recall the last time I chose to keep something in a book that an editor suggested I change or remove–simply because they were always right! One more thing to think about is this: if you’ve got a knowledgeable book person suggesting you rework/cut a scene, it’s likely because *something* isn’t reading clearly. You may not have to cut it apart, but it’s definitely something to dig into a little more. Maybe you can find a way to work in your beloved bits in another area? The most important thing is that you feel good about your book as a whole, and ideally, you get to work with agents and editors whose vision aligns with what you’re aiming for. Above all, communication is key, trust yourself and your colleagues, and keep tinkering! I think killing your darlings is great advice, but there also might be a way to relocate or rework your darlings too! Yay! I’m so excited to interact with you two as I love both of your work! Mike, your tweets are inspiring, and I love how you give shout outs to your fellow author friends! Jess, I am wondering how you plan out your nonfiction books. For example, do you think about the layout and illustrations while you write? Do you have influence about what each page looks like as well as what it says? Great question! I tend to be a very visual writer, and with expository nonfiction, in particular, I approach it from more of a ‘whole book’ perspective, rather than just the text. It’s not always the case that authors get any input into the visual design or layout of the book, but I’ve been fortunate: in all cases, editors have asked my thoughts on illustrators, illustrations, and overall design. Typically, the art team knows best, and I trust them fully! With my World of Weird Animals series (Pink is for Blobfish, etc), I knew the design would be very important, as I wanted it to be laid out with various types of text. I wanted larger text over a bright photograph on one side of the spread, and longer, but smaller text used to create bursts of information. My awesome editor and I had the same vision for the book, so it played out really seamlessly! For more narrative nonfiction (like Shark Lady, as an example), the question becomes more about the information you’d like to convey visually on the page to pair with the text. As I mentioned, my art director was really great about inviting my thoughts over how the illustrations would appear. With a more scientific or historical subject, this can become important. For example, our end pages for that book feature recognizable species of sharks–this was very important to me, as kids can then google what they read about, and see the real life versions very easily. In both of these cases, it was about finding the line between creative license and accuracy. I want the illustrator to feel totally free to create their vision of the book, too. In Pink is for Blobfish, and the others in that series, David DeGrand’s illustrations are a great example of this: he receives the text I’ve written and is free to create what he envisions, typically using animal pictures as reference. I trust him wholeheartedly with this, as he’s a super talented artist. Then, my editor and I go over these illustrations to check for any glaring issues that might stand out. I can remember my editor once asking how many toes a pink fairy armadillo has, so they could make the cartoon as accurate (though totally goofy!) as possible! So excited to see you both, Jesse and Mike. TY for making time in your busy schedules. I know Jesse writes NF, and Mike, MG. This is a PB bio question for either/both of you. I am writing about a lesser known biographee who created a form of bluegrass called “New Grass.” Am using quotes of MC to structure the story. Wonder if I should add some setting via time period from 50s-1970s to ground it for kids? If I talked about hippies, Smothers Brothers, etc., would they care? Thank you. That’s so great that you’re working on a biography–we need more of them out there! This is a hard question to answer without reading the book, but I will say that context is probably key here. You want your readers to be able to fully immerse themselves in your story without getting tripped up. That being said, a little bit of mystery, or some sort of a question is okay too, provided you’re laying out enough information for them to put the bigger picture together. I would recommend getting a few people who aren’t familiar with the subject at all to check it out, and see if they get tripped up. If there are missing pieces or gaps, you might be able to drop some textual breadcrumbs that fill in those pieces for them. Because it’s a picture book, you will also have an opportunity to convey things visually, so keep that in mind! Also, maybe try breaking down those more difficult to convey concepts into a broader sense. Instead of first saying “Smothers Brothers”, you might first introduce them via some short description within the text, then working them more into the story. Quotes can be difficult, as they often rely on some former knowledge of the world the person is speaking out, but I have no doubt it’s possible to do this–it will just take some time to work it all out! TY, Jess. I’m looking into so me mentor texts that may help, like WHEN PAUL MET ARTIE (Simon & Garfunkel – similar times) Having those unfamiliar w/times and what doesn’t make sense to them as readers will be very helpful. Good Morning Mike and Jess! Thank you for spending time with us this morning. Your books are fabulous and kids absolutely love them. My question is for Jess this morning, I attended one of your sessions at Nerd Camp, Nonfiction Nerds Unite. You talked about three rules you try to live by: Pay attention, Be Astounded, and then tell the world about it (paraphrasing, adjust if my notes were mistaken). Can you elaborate more on how I might invite 5th graders to use these rules in their own lives and how it can aid them in their own writing. I was thinking of a bulletin board idea around your One Amazing thing about today where each students will add something to it each day. How do you take these amazing things and turn them into research? Thank you once again for your time! Love this question! Yes, as a writer (and more generally, a human), I try to keep Mary Oliver’s advice close to heart: Pay attention. Be astonished. Tell about it. This just embodies so much of what is important to me, and why I do what I do! When it’s broken down, there are really three key skills we’re talking about in this quote. We’re asking kids to pay attention. Then we’re asking them to notice what they find fascinating and what they’re curious about. Finally, we’re asking them to convey that information in some way that feels right to them. So, I’d start first by breaking down those key skills into smaller exercises, bearing in mind that there’s really no wrong way to do any of this! To pay attention, you might get them started on simply picking up on details of the world around them. Our six senses (yes, I include intuition in there!) are great starting points! Ask them simply to notice anything and everything. Maybe a five or ten minute jaunt outside just to BE outside, or a “free for all” library session, where the goal is simply to peruse books with no end goal? The next step is asking them to judge what they’re picking up. We’re asking them: what do YOU find amazing? I’ve met a lot of kids who tell me “nope, nothing amazes me”. But it’s usually only because they’ve had some adult in their lives discredit what they actually enjoy! Soccer, insects, even video games are all the gateways to more exploration. Because we’re just looking at reflection here (and not the next step), a quick way to do this would be to make a giant list of just “stuff”. Things around us. Things in our classroom. Things we see on TV. Things in books. Things we feel. That sort of thing. Then, you could go through and get kids to simply add a star next to the stuff that makes them curious, happy, excited, or amazed. That’s ALL they need to do–just star it. This can be a fun one, as there will always be surprises. The final step is the “tell about it”. Many people interpret this to be “write about it”, but it’s important to remember that kids might want to express themselves in different ways, and I personally think that we need to encourage *every* (safe) form of expression there is! Maybe give them the option to express what they love or are learning about in whatever way they feel they want to? I love your idea of having a bulletin board with all sorts of different amazing things–maybe you could compile one as a class, and then everyone gets an option to express their thoughts as they please. You could easily turn this into a research project as well–provided the end result is also some form of expression that they want to use to “tell about it”. The biggest hurdle seems to giving kids the freedom to not judge their own interests. They see us judging our interests (we call certain books “guilty pleasure books”, for example, or they hear us say “oh, I don’t have time to journal or paint!”). How can we expect them to honor their curiosities and passions if we don’t honor them ourselves, right? Growing the spirit of curiosity in a classroom and allowing all passions to be counted is such an amazing thing–those kids are lucky to have you! Thanks for the clarification, Jess! Great question, Heather! I was at that session, too! Thanks for breaking it down, Jess. I’m moving back to second grade & I’m very excited about it! I hope to put up a Wonder Wall & give kids time to explore & follow their passions! Lesley!! I love the idea of a Wonder Wall! Take pictures! Hi Mike, I agree that we need diverse books in our libraries so that all children can make connections with the stories. I want to continue building my school library’s collection in this category. Some of the books that I already have include those written by Jason Reynolds, Jacqueline Woodson, Crystal Allen, Varian Johnson, Gene Luen Yang and Barry Deutsch. What other authors and/or book titles that fit this genre would you say are a must in a school library? Hi Lynette, I very much appreciate your commitment to making your school library as fully inclusive as possible – we need that so badly, and the fact that you’re making that effort is a wonderful thing for your students. I’m a big fan of all the authors you listed, so hooray for the authors you listed! On an overarching level, it’s profoundly important to focus our collection development efforts on including books about and by (preferably both) people from historically marginalized communities and cultures. I focus my efforts most strongly on racial diversity and neurodiversity, but it’s just as important to consider ethnicity, gender, sexuality, religion, and more. Approaching it from the perspective of individual authors and titles is an excellent thing to do, and I’ll list some of my own favorites in a bit, but we also need to internalize this work on a broader level too. In addition to looking for authors and titles, we can also look for sources of reviews, recommendations, awards, and scholarly analysis. The We Need Diverse Books™ resource page is a great place to start finding those sources and incorporating them into the foundations of our collection development processes (https://diversebooks.org/resources/where-to-find-diverse-books/). Thanks for this info! Your input is much appreciated. Thank your being here, Jess, and Mike. I’m working on a PB bio of a bluegrass singer/songwriter who has been forgotten, yet contributed so much even beyond music. How much grounding of setting do you feel the reader needs? My MC’s most prolific/interesting years were 50s-70s. Would this info be better suited of back matter? Thank you both for being here. I wanted to know how you encourage adolescent and teen readers to read for pleasure? I teach high school ELLs and most of them struggle with reading and often feel like reading is another obstacle, not something that can be fun. I try my best to have a classroom library but I’m a traveling teacher. How can I help encourage my ELL students to develop a habit of reading for themselves? Thank you very much! My kids are mostly second language learners and I talk up books I’ve read or those that have just come out. I read to them portions of books and it may spark the interest to go read it. Talking to them like they are readers makes them want to be involved in the conversations. Good luck. Your kids are so lucky to have you! I agree with Diane as well–I know that one of the best ways kids get into reading is by seeing their adults just as into it! Book talks, read alouds, sharing book trailers (Mr. Schu Reads has an amazing blog for this! ), and giving kids access to all sorts of books (including graphic novels/comics) can be so helpful! I know a lot of kids feel uninspired about reading because they’re “stuck” reading certain books that don’t interest them, so getting an opportunity to read something they choose (regardless of whether it’s “their level”) can give them some of that enjoyment and confidence back. Also, I know a lot of kids who got into reading by checking out book versions of movies they already knew and loved–those novelizations were sort of laughed at when I was a kid, but I adored them! To me, that’s what a reading life is all about: having the freedom to choose, which in turn builds confidence to keep reading. I thought I knew pink until I read your incredible book Pink is for Blowfish. It expanded my world! The format of the book really works to engage the reader as they learn about these pink wonders. The photographs in the book and David DeGrand’s illustrations are fabulous. What gave you the idea to write the book in this format? Any particular reason why you chose to focus on pink animals? Thanks for taking time to answer questions today! Thank you so much! I’m so happy you enjoyed BLOBFISH! I chose to focus on pink animals because pink can be such a gendered concept. I’d had a list of amazing pink animals in my head for years, and it was time to get them out! I knew I wanted the series to be about our judgments, as well as about animals, so pink was the perfect starting point! As far as the format goes, I knew that I wanted the book to be enjoyable for kids of various ages, from teeny tiny (who maybe just enjoy pictures) to older readers who would be reading the longer sections. I have an amazing design team at Knopf, and their layout was so perfect–I was thrilled to see the first copies! I absolutely love having full color photos (I loved photos in nonfiction as a kid!) and David’s art really brings it to another level! Thank you for your questions!! Thanks so much for answering questions today! I am wondering about getting published. Is it important for a Canadian writer to have a Canadian or American agent? Also do you need to have a strong social media presence before you publish? Hi Diana! For what it’s worth, I do know one successful Canadian author who has an agent based in the States, but I honestly don’t know how much it matters. I don’t put much stock in the idea that a social media presence is required, although I do think it’s important to have a website or blog or something that has your basic info – contact info, what kind of writing you do, etc. The first and most important thing is actively developing a practice of improving your craft, and committing yourself to that practice for as long as you choose to write. Fun question! I’m Canadian, and also live in Canada. My agent, however, is in the states. I don’t think there’s much of a difference in US vs CDN agents, provided they are both are reputable agencies! I know several Canadian authors with US agents, and several with Canadian agents. The most important thing is that you and your agent are aligned in terms of vision, and that you guys are a great team! That being said, being Canadian did inform how I approach social media, especially as I was starting out. Given my location, I knew I wouldn’t be able to be “in person” at many of the bookstores or similar events where I’d be interacting with other authors. It was really important for me to meet others in the field, and I also really wanted to grow relationships with educators, because I wanted to be on top of how books are used in various ways in the classroom. So, I put a lot of emphasis on social media, and got very specific about the platforms I enjoyed, and how I wanted to express myself on there in an authentic way. Can you please talk about your agent selection process. How did you go about picking your agent? What was most important to you and what did you based your decision on? Agents! Great question. First off, here are some quick links that came to mind that were helpful to me back when I was querying, or that I’ve come across since! My personal experience with choosing an agent was pretty straight forward: I had only submitted to a handful of agents at the time, based on their online presence and what I sensed to be an overall compatibility personality-wise, and what they seemed to be looking for in manuscripts. I heard back from a handful of them, and after speaking on the phone, it became very obvious to me who the right match was—it boiled down to her personality, communicative nature, humor, smarts, and what she valued in stories. Everyone prioritizes different strengths, so really it’s about learning enough about an agent to judge whether their style resonates with yours! Long story short, I think doing your research is very important, as is targeting your queries in a systematic way. From there, ask questions and trust your gut!! Finally, if you’re looking to research more agents, the amazing Debbie Ohi has a wonderful twitter list! Follow these lovely folks and start listening to what they enjoy and you might find some good fits to query! Do they represent authors whose books bear some similarity to the books I want to write? I don’t think this one has a lot of wiggle room – for example, an agent who focuses on contemporary realistic YA is a non-starter for me, since I don’t write contemporary realistic YA. Do they have a successful track record of sales? This one has more wiggle room, of course, since “successful track record” has a lot of variance. My agent (the fabulous Ammi-Joan Paquette) was still very early in her agenting career when I signed with her, and I could have signed with other agents who had longer and splashier sales histories. Joan’s early sales gave me the impression of an agent who was off to a pretty fast start, though, and that impression turned out to be accurate. What do people in the kidlit world think of this agent? It’s not always possible to know this, of course, but if you’ve become an active, visible participant in the kidlit world’s overall dialogue, you may be able to gather some opinions on an agent both professionally and personally. If the agent’s a vocal presence online, you can sometimes get an impression of their personality and approach to the business. This is only a first step, though, because eventually you’ll talk directly with an agent, and then you’ll know better what you think of that person. What do I want in terms of personal interaction with an agent? I’m very scattered, sometimes very effusive, never terribly excited to talk on the phone, prone to big slobbering displays of sentiment, and equally prone to sending emails full of goofy nonsense with no real connection to the actual publishing business at hand. I make a lot of jokes about donuts and cats. I like working with an agent who welcomes all of those aspects of my communication style, doesn’t get impatient with them, and can still tell me things I need to know, when I need to know them. I also value working with people I genuinely like, which is not the most hard-edged superbusinesspersonlike way to go about things, but you know, I yam what I yam. Jess provided some really good links for you, so definitely dive into those and absorb the info there. And good luck! Hello and thank you so much for your time! My question is about time. As teachers we are so devoted during the school year and time for writing is fleeting. I have always thought of myself as a teacher who writes but would love to be an author who teaches. What advice would you give to someone who loves to write but has more ideas than time? Again thank you. I look forward to this every summer. Ah yes, more ideas than time! I think we all struggle with this in some form or another. I love that you’re trying to write more! My first suggestion is to be very careful with the stories you tell yourself! Often, we take something important to us and turn it into a very huge hurdle, because we’re trying to accomplish it all at once, or completely rework our lives to do so. And trying to find time to write all of your amazing stories definitely is a big hurdle! But, instead of thinking you don’t have time to write them all, maybe instead try flipping your perspective: you’re a teacher with so many ideas, and all you really need to do to wrangle them is come up with a plan. And that plan can include some very small, digestible bites that will totally fit into your schedule! So much of being an author is about mindset, and developing ways to actually get your ideas down in a sustainable way that allows for you to actually live your life! So, to start small, my second suggestion would be to get yourself a writer’s notebook. You’re a writer already, so I’m going to assume you have one! My next suggestion would be to explore your calendar and find a few pockets throughout your day or week where you can devote some quiet minutes to jotting down all those ideas! (It will be easier to do this in summer, I’m sure, but I also urge you to try to find some pockets that might work throughout the school year!) Ideas are great in your head, but they are much more useful on the page! The more ‘user-friendly’ your system is, the easier it will be to stick to. Maybe it’s five or ten minutes at the end of the day before bed, or when you go to the pantry to get the dog food–stick your notebook in there and nobody will be the wiser! Don’t be discouraged if you miss sessions, or you find you can only do this for a few minutes each. Every little thing you do to honor your goal here will serve you—it’s all good. The unfortunate thing is, I think you will never truly “have” time. (And, as you become an author, that time will continue to get eaten up, so it’s great to have the system in place ahead of time!) In my experience, it’s more about honoring your goals enough to take the small steps to “make” time. Does that make sense? I know that’s probably not the most helpful answer (over, say “book a cruise and write the whole time!”), but the more you can integrate this goal into your normal life, the closer you will be to it! Lastly, rest easy–many (in fact, all!) of the authors I know also juggle jobs, families, kids, illness, and all sorts of other hurdles that make it really hard to get their stories down. You got this, Diane. You just need a solid plan to lean on! Best of luck with it all, and thank you so much for devoting so much time to your students! The world needs your stories–don’t give up! Hard does not mean impossible. Sounds like a great banner to hang up in my library. Hi Diane! I’m right there with you on the challenges of making time to write. I have a writing career, I have a full-time day job working in an academic library, I’m pursuing an MLIS degree in order to eventually jump to children’s librarianship (I like working in libraries, obviously), I do a smidge of volunteer work, I’m happily married with two young children, and I train in aikido at a local dojo (Aikido Shusekai! Dojo pride!) three times a week. If you’re thinking “dude, that’s a lot of stuff,” or just “that’s a lot of stuff” sans “dude,” well, yeah, but I think in sum it’s actually not more stuff than most or all of us do in our lives. We all make choices about the things that add up to our 24 hours per day, and whether we realize it or not, we’re always choosing to not do the vast majority of things we could potentially use those hours on. I don’t spend any time getting into the outdoors and hiking, for example. I like throwing dinner parties, but dinner parties haven’t made the cut in a pretty long time. I watch TV and movies on Netflix, but I’m always doing something else at the same time. I will confess that I spend far too much time being argumentative on Twitter, though. I won’t lie and pretend like I possess a superhuman level of serenity about juggling the demands of my life, but that’s okay, since it really just means I’m no different from anyone else that way. I do try to be as conscious about and psychologically present in that juggling process, though, because it helps me realize that I don’t have to define any of the things I’m doing as adversarial to any of the other things I’m doing. I’m not a writer who works in libraries, or a library professional who writes: I’m a writer, AND I’m a library professional. I’m a parent, AND I’m a graduate student. I’m a husband, AND I’m an aikido student. That also means I can legitimately declare myself to be any one of those things on its own, of course. Like this, for example: I’m a writer. There are plenty of concrete tactics and strategies for managing this declaration of self on a logistical level, of course; Jess has already shared a bunch of them here. I’m a believer in internalizing the idea that being a writer is a real part of who we are on a holistic level, though, and I’d bet the house you already do that in more than one of the other roles that you choose to fill in your life. I have never thought of the roles as bring anything but competitive. Thank you for this wonderful new insight. I wondered if you might share a little about your approach to finding mentors. I am almost at the querying stage, and I am thinking of reaching out to some published authors online to see if they might be willing to let me pick their brains at all. I obviously don’t want to overstep, though (or risk creeping anyone out!). Any suggestions? Thank you! Hi Sarah, your instinct not to overstep or creep anyone out is spot-on, because taking on a mentorship role isn’t something a published author is likely to do on a cold-call kind of basis – it involves time, energy, and hard-won knowledge, so I’d err on the side of caution when reaching out to authors, especially if you don’t have a genuine personal connection with them. There are opportunities to pursue mentorship on a more structured level – SCBWI’s mentorship programs, for example (https://www.scbwi.org/scbwi-mentorship-programs/) – so you might consider looking there. It’s pretty obvious that social media’s drawbacks can be genuinely threatening, all the way up to the societal level, but one of the great things about social media is the fact that we’re all privy to a broad range of conversations about writing and publishing that previously weren’t visible in the public sphere. There’s a lot of information online now, and a lot of ways to glean knowledge about the publishing world, although it pays to be engage our information literacy skills when sifting through it all, of course. My editor is my biggest mentor – I mean, it’s not even close – but that didn’t happen overnight, or because I approached him out of the blue and asked. We had friends in common in a couple of different online venues, which is how he learned I actually, you know, exist. We later met at an SCBWI conference and hit it off, he acquired my book shortly thereafter, and we’re now in working together on my third novel. I didn’t try to force the beginning and continued growth of a relationship with my editor, or with any of the people who I go to for advice; those relationships all developed because I made the conscious decision to be an engaged and visible member of the children’s literature community through both online communication venues and in-person attendance of events. It’s taken time, and will continue to take time; I’m not a genius when it comes to forming fast, firm relationships with people, but even I’ve had some astonishingly good experiences come my way. Be patient, take your time, but also do what you can to participate in the global children’s literature dialogue. The relationships will eventually follow. Echoing Mike again, doing what you can to participate in the dialogue of children’s literature won’t fail you, and given time, I have no doubt that all of those relationships will grow over time! 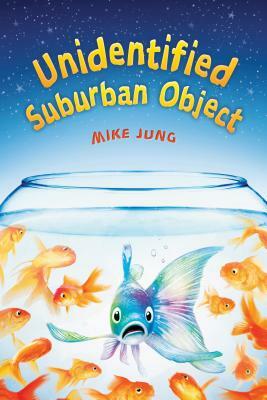 Hi Mike: I’m wondering about your process of writing “UNIDENTIFIED SUBURBAN.” Is it difficult to write something that is both realistic fiction and part fantasy? How do you balance that? What is your writing process in general? THANK YOU!!! Hi Natalie! I didn’t particularly find that aspect more difficult than any other part of the process, mostly because I think even a full-blown epic fantasy kind of book also needs to be realistic in important ways – the relationships between characters need to be true on an emotional level, individual and group dynamics need to be real on a psychological level, and large-scale worldbuilding needs to be first considered within the context of the real world. My first book (Geeks, Girls, and Secret Identities) is set in a world populated by real superheroes, so it has a much more obvious speculative fiction tilt, and I made a big effort to ground all of the Superpowered People in Spandex stuff in a framework of reality, even though most of that stuff didn’t actually appear on the page. There’s a superhero leadership council that’s more than a little like the board of directors for a noticeably dysfunctional non-profit foundation I used to run across in a previous chapter of my professional life, for example. In USO, there’s a fairly big chunk of scrawled backstory about why Tau Ceti Four alien DNA is almost identical to Earthling DNA. I spent what may have been a little too much time figuring out why the Chloe’s parents don’t have the remains of a spaceship stored in a cellar or something like Clark Kent’s parents do (it’s partly because they live on the west coast where houses don’t have cellars, and partly because they deliberately chose to destroy it and minimize risk of discovery). I’m really happy about the scene where Chloe complains to Shelley about the problematic race-related aspects of extraterrestrials in science fiction novels, because it feels like one of the scenes in which I most successfully fused the fantasy and realism sides of the story into a sequence of words and actions that accurately reflect Chloe’s intellectual and emotional identity. So! I guess I don’t really think of it as a balancing act – in my mind, it’s more like a process of fusion. Thanks for answering all these questions, Jess & Mike! Lots of interesting and helpful information here!